A direct quote from Archant’s Michael Bailey of course but it does kind of sum up the way this “competition”, aka the Carabao Cup, is viewed by managers and head coaches across the footballing spectrum. Give the squad players some game time appears to be the mantra. But I think we got a lot more out of it than Cardiff did. For a start it’s always pleasing to beat a Colin side. Any Colin side. The clubs conspired to choose 19 selection changes between them but there were certainly far more positives for those of a yellow and green persuasion. First of all, hats off to Max Aarons and congratulations on your first senior goal. A very cool finish as well, it must be said. And the enigmatic Dennis Serbny pitched in with a couple of crackers; an emphatic drive from 15 metres and a far-post header that he made look easy from a delicious Stiepermann delivery. Tetbull offered real stability and despite Cardiff’s single late reposte we never looked in danger of slinging this one away. So where does this leave Daniel Farke for Sunday? Will he go for a 5-2-3? If he does, on last night’s evidence there is a trio of young guns battering down his door for inclusion in the form of Emilio Buendia, the aforementioned Aarons and most pertinently Ben Godfrey. I guess they’ll all revert to the bench, along with Serbny, but they can all consider themselves slightly unfortunate. I suspect there is a fine future ahead for all three of them but I’m not the head coach so do not know precisely when their time will come. The idea of Aarons and Jamal Lewis in tandem as our full backs/wing backs appeals to me very much indeed. The raft of changes last night also indicates to me that Farke understands all too well the importance of Sunday. As Gary, myself and several MFW posters have said, many of the natives were getting very restless as we left the ground on Saturday. Listen guys, not only can we not afford to discharge Farke and his entourage I don’t believe we should. We are going nowhere this season so surely they should see their contracts out. We might yet be pleasantly surprised. I did say might. I am going to have to end by saying there are lots of folks rumouring the Russell Martin-Matt Gill pairing as our next management team. Now the thought of that ever becoming reality is enough alone for me to want Farke and Co to remain. I really do not know where these rumours come from, but that is one I hope is false. So, come on Daniel, beat that lot down the road, rise us up the table like a phoenix and keep your job. The aforementioned alternative bears no contemplation on an empty stomach. I’ll be honest, I was gobsmacked at the result last night, pleasantly I might add! The main thing it shows me is we have a squad who appears to want to play for team Farke. I still have my reservations about the long term sustainability of “the model” but I would have been more concerned if we’d not turned up again, (this time with the second string). Ultimately It would have shown there were serious problems regarding tactics and desire right throughout the squad. City just need to get over this “bipolar” trend they currently have and Instill a modicum of consistency, then I think we can truely judge how good we could be. I was slightly shocked as well But I’m glad our “reserves” beat Cardiff’s. I suspect Daniel Farke will have learned a lot from that performance. I struggle with the general concept but I can still keep the footballing model and the finance aspect apart in my head if I concentrate hard enough. Sunday’s selection will indeed be interesting. That so called rumour hopefully will go if Martins goes out on loan and the sooner the better Gill is doing a sterling job with the youngsters at present. The game last night prove that we do have some potentially good players coming through the system. If Team Farke sees Godfrey as a CB where does that leave Zimmermann who is also very good in that position, so if Klose leaves we should have cover and thst lesves Raggett surplus so as I said a few days ago why did we buy him??? The trolls were out on the Pinkun as usual still wanting Farke out that will never change. As for last nights game I hope that there is an article from one of the travelling supporters to give their own view. lastly Farke now has a few decisions to make before the Ipswich game and we can only hope he gets them correct to ensure that the winning streak continues. Hi Alex I don’t know anyone who went last night – my mates aren’t that brave (or can’t get enough time off work). Hopefully somebody may correct that and post about their experience. Farke seems to have Godfrey nailed on as a future CB (shortish in stature for that role but built like a tank) – we’ll have to wait on a directorial decision on Timm Klose’s future before anything comes to fruition in any case. Zimbo is always there or thereabouts within the squad..
As for the media outlet you mention I sometimes look at it but no more than that. The comments can veer towards the crazy and I avoid. Finally I agree with you – Matt Gill has so far done a fine job. Blimey Gaz! That revelation has genuinely surprised me. But in a kind of pleasant way. I neither went to Cardiff, nor listened to any commentary of the game…….but for Norwich to score 3 times away from home (excepting the oddity of Hull last season) was nothing short of remarkable – that it was against a Colin team made it (for me) really exceptional. It appears that we have rather better depth to our squad than Cardiff do although they are in the Prem, and following on from his cameo against Preston, seems that Webber has found some player in Emi Buendia. For me, just the sort to get at the Binners. By all accounts Godfrey and Aarons were good too, but will any of them make to starting eleven for Sunday – somehow I doubt it. Oh; and just how much class does Cameron Jerome have?? Surplus to requirements at Derby, but refuses to join 1p5wich on loan because of his affection for NCFC – legend!! Yeah I saw CJ’s comments too – pure class as you say. The Binners couldn’t afford him in a month of muddy Sundays in any case.. He was an EXCELLENT servant for us. I will never forget his opener against Boro at Wembley as I was right in line with the six yard box. I truly wish Cameron well whatever he chooses to do. Good result last night. I genuinely believe that Srbeny suits our current system far more than Rhodes. He has more pace, which is required as a lone striker. Buendia needs to start on Sunday, as Leitner still doesn’t look ready for the Championship. On paper, we should be top 6 contenders in the Championship. Watching Leeds last week, shows the difference a manager makes. This leads me to having concerns about Farke’s decision making and tactics. It’s quite clear we look more solid with 3 at the back. Yet he still persists with 4 at the back. Tim Klose should be nowhere near the starting eleven either. I would play Hanley, Godfrey and Zimmermann against Ipswich. I think we need to go with three CBs on Sunday for sure, although I would start Klose over Zimmermann. I’ve yet to see the “opposition” under Paul Hurst but I’m willing to bet we’re in for an aerial bombardment at some stage. I completely agree with you about Buendia/Leitner although I’m not sure about Srbeny/Rhodes. The former’s cracking goals at Cardiff will have done his confidence the power of good and that’s for sure. You may well be right on that issue – I can’t really call it one way or the other. I think I was one of the very few thrilled about drawing Cardiff away – as I live in Gloucester it gave me the chance to see my first game of the season! It was a fantastic performance with many impressing. Even if it’s not this Sunday, I would expect the likes of Aarons, Godfrey & Cantwell to feature prominently as the season goes on. I just commented on Gary’s article to say exactly the same thing about Aarons & Lewis as our FB’s. I think the most pleasing thing after what I’d read following Leeds was the passion, desire & work rate all the team showed. There was certainly no signs of players giving up on Farke, which for me really is the time to panic. Other than mumblings from the guy in front of me about how Srbeny will never score (he strangely went quiet after that…) there was a fantastic, positive atmosphere amongst the fans. Glad you got to the game and thanks for your observations. I guess your “local team” must be Forest Green? There’s nothing like seeing a few home-growns and astute signings doing their stuff. I’m specifically NOT talking about any MFW posters here, but those on other sites calling for Farke’s head on a marlinspike are a little shortsighted imo. Yes, Forest Green & Cheltenham Town are my two closest league clubs. I go occasionally but spend as much time looking at Twitter updates on our games as actually watching!. Certainly agreed on Farke. Personally I like him & would like to see us give him the time to build something. However that is equally driven by my lack of faith in the ownership & my belief we will find it difficult whoever is Head Coach/Manager. It’s telling just how many posts on a variety of articles inevitably come back to that issue. Telling is indeed the word. The adherers are getting fewer, believe me. McGovern in goal, Aaron’s right back, Thompson, Godfrey central midfield and Buendia in the number 10 slot. Sorted! I think the Martin/Gill rumour is just that a concocted rumour by someone who wants Farke gone. I cannot see for one minute that the club would change the whole set up to accomodate two ex players, especially as using past players has hardly been a success. The set-up is set and won’t be changed with one go at it. There will be a coach somewhere in Europe who will be earmarked. Farke will get to see out his contract for sure, there is too many of his backroom staff to pay off . I just get dumbfounded by some of the rumours that float about! If the fans turn on Farke and the board big time then that will be his time up! It’s far too early to “turn”. The Board couldn’t be blasted out with a Howitzer anyway. I say give DF some breathing space! Farke has a dilemma now because if he reverts to the same team as Leeds game and we have a bad day there will surely be a big reaction. 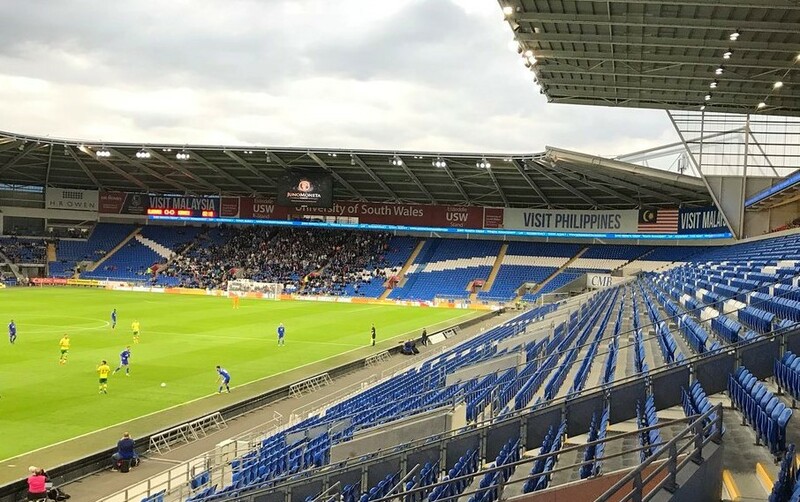 Also it would send a more encouraging message to the Cardiff group if one or two were selected, and a good kick up the bottom to the rest. I wonder what Sir Alex would do? He won’t revert to the same team. Tetbull are much more likely to start to begin with, and his defensive set up will be really interesting. But he may well have 3 CBs there. And maybe Buendia will be given a chance behind Rhodes, with Leitner as a sub. For me, it’s great that Farke has a few selection problems. I’m also not going to slag him off yet; there have been mixed signals in these first games, and our points tally could indeed be much higher. Let’s see if we can go on any sort of run first. I will reserve any kind of overall judgements until after the first 10 games. What Farke is trying to do is still a damn sight more interesting that what Alex Neil fed us, and I love his willingness to use motivated and talented young players from the Academy set up. Such a wonderful change!. I would like to see all three of Godfrey, Aarons and definitely Buendia involved from the start. As for Sir Alex, would he have started a youthful Scholes, Beckham and Giggs away at Man City? Yes I think he would actually. We’ll simply have to wait and see what Daniel Farke does. I seem to be in a minority of one here, but I wouldn’t start Buendia on Sunday. The hurly-burly of the derby’s first 20 minutes wouldn’t suit him – whereas he could be a hugely impactful sub when things settle down. However, I’ll trust Farke ‘s judgement on that. There’s a case for three at the back, but I’m not convinced we’ll see it. Unlike his first pre-season, Farke didn’t practice two defensive formations equally this time. Happy to be corrected, but I’m not sure he played the three at any stage of the pre-season games. I still want Emi on from the start! Very interesting article Martin that has conjured up some excellent responses. Think you are right that we will have Farke for longer yet and should do. I cant help but remain optimistic with reservations. My optimism is due to the young players stepping up and also the midfield and striker options we now have. So i still feel if we stop leaking sloppy goals we will be half decent.. Lets face it we put Leeds on the front foot and how many Championship sided would recover from that this year? Personally i would play three at the back on Sunday but i doubt Farke will.. Interesting stuff. You make some very good points there Richard. The youngsters are indeed stepping up and I guess that approach comes from Farke. He (Farke) certainly deserves to see the season out at least. Those elsewhere calling for his head are just plain wrong imo. Let.s hope Sunday brings us joy. I the last few articles there has been a few moans about Farke not using the older players and it is assumed that he might not beable to control them the way he does with younger ones. this maybe true but he is getting reasonable preformances out of Klose at present. If you take Jose M he likes to buy ready made players then try and mould them into a team his outlay on player’s would keep city in the self financing for a couple of years he would then get the players to believe the world is against them and win titles and cups till it all falls apart, 3 years is his average at a club. Then there is Farke trying to do a Poch building a team from the youth and cheap imports as with Poch he gives the older players time to adapt to new methods some as in Hanley, Klose Pinto have taken it in to some degree others like Olivera, Naismith, Martins and Cameron have proved that old dogs sometimes can’t adapt to new tricks so have been moved on. lets hope he that we see more Poch than Jose and a more winning mentality. Although you focus on a trio of young guns, in reality there are two more to think about. Lewis is already established, but he is still a young gun and learning the game. Thompson is also on the verge of at least semi-regular starts, depending on Tettey’s knees. By all accounts he was OK in the Leeds debacle, and it will be interesting to see how he gets on if he plays against weaker teams such as QPR, Reading and/or you know who. All this means is that there has to be a bit of a balancing act. Young defensive players need to start games – 20 minutes or less as a late sub doesn’t really teach them much. Suppose we play a few games with a back three, wing backs, and a holding midfielder. Is Farke likely to make 4 of those 6 players Aarons, Godfrey, Lewis and Thompson? It would be brave. But at least he’s got the options beginning to come through. Given how much fans have demanded we bring our own players through more successfully (whilst winning the league at a canter of course!) that’s very welcome. I think what’s become ever clearer is that Farke and his colleagues are decent coaches who can bring people on over a period of months. What he doesn’t seem to have is that little spark which has an immediate impact on an experienced squad that the likes of Bielsa has shown at Leeds. But then, in truth, how many have? I can understand that people want to see a Lambert-like impact from whoever our Head Coach is; in reality it is much more likely to be the kind of gradual improvement that happened under Worthington. “What Farke is trying to do is still a damn sight more interesting that what Alex Neil fed us, and I love his willingness to use motivated and talented young players from the Academy set up. Such a wonderful change!” Liked that comment v much Michael D. Thank u!